A Confession – my books. my life. 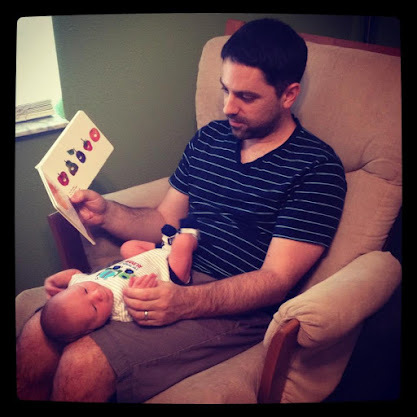 I don’t read to my son. (1) The kid can’t sit still. At 9 months, he is a constantly moving target and trying to read a book to him results in said book being pried from my hand, placed in his mouth, and usually carried across the room. (2) Weekdays are so busy. We spend our morning getting ready and head to daycare/work around 8am. By the time I pick him up and get home in the evening, it is 6pm. And with a 7pm bedtime, that barely leaves enough time for dinner and maybe an evening stroll. Not much leisure time for reading. (3) I keep thinking I’ll get to it when he’s just a little bit older. The he gets a little bit older and I put it off some more. If a tendency to pull all of the books off the shelves is an indication of a future reader, then I’m all set. But I fear more is required. So I need your advice. How do I introduce Evan to books? What did/do you do with your kids? Do I just need to be patient and let him eat the books for now and just be glad he’s showing some form of interest in them? Do I need to try harder to get him to sit still and listen to a story? My children were good about stories/books early on. I think we just kept that routine of reading each day/night. There was always some down time, when they stopped moving. For us it was nap times on weekends and bedtimes after nursing or bottles, or just before putting them in the crib/bed after they stopped bottles. I’m sure you and Ben will find the right pace with Evan, he will enjoy his books and the occasional book in mouth won’t hurt..ha ha! There really is no sitting still with E. Even when he’s tired. E was the same way. Up until about 11 months, I kept trying to sit down and read a story with her, but she was always wiggling, never wanting to sit still. But seriously, at 11 months, it was like a switch had been flicked. We read after she wakes up in the morning before breakfast and throughout the day. She has favorites that she gets, too. Granted, they’re short board books, and you can tell when she’s done cause she pushes them away, but she’s much snugglier now. Just keep trying, at different times during the day (especially on the weekend, when you have more time). As long as he sees them and they’re there, he’ll get there. So I guess I just need to be patient. This sounds familiar. I keep books out for him to “play” with. And we try to read a few pages when I see him grab one. Maybe read to him while he’s in the crib waiting to fall asleep? That might interest him in hearing your voice telling him stories. It’s worth a shot, but I know how they can be at this age, what with the flinging and grabbing of books! I had this problem with my oldest. He just wasn’t interested. We would try and he would just squirm or eat the book. He didn’t actually sit still for stories until he was over a year old. I say, don’t stress it. I think exposure to books is the most important. Your son will be ready when he’s ready. My son’s now 10 and loves reading despite me not being able to read to him as a baby. Don’t stress it! He’ll love reading someday because you do. We’ve always read lots of books at bedtime, and until recently it was often WHILE nursing, ensuring a captive audience! 🙂 But at other times of day it was sometimes hard at that age. I took to reading a story at mealtime when he was sitting still for a few minutes. The most important thing I’ve learned from parenting so far is that kids will do something when they’re ready for it. Respect his choices as you would with an older child. Forcing an activity that someone is not interested in or ready for definitely doesn’t create a love for it. I used to read to my Evan when he was in the tub. Religiously. Is he a reader today? No. My daughter is and I never had the time to read to her. There have been many times when a story has started with Elle on my lap and ended with her sitting on the floor and me continuing to read because I just want to finish the dang book. It’s better now but when she was Evan’s age it was impossible. I did read to her a lot when she was a baby, mostly because I was bored and didn’t know what else one did with a tiny little baby. Now that Elle is older she still isn’t interested but we try to find things on the page or sometimes I’ll just make up the words if the story is too long. And then there are those nights when she asks me to read a book and I tell her “tomorrow” because it’s late and even though its 5 minutes it just seems to take forever. Hmm…I wouldn’t stress about it too much. I think the fact that you love books and that he has books available to him will accomplish a lot. Maybe see if you can set some time aside on the weekend to try a story or two or keep some in the car so he can look at them while you are driving. To be honest, I’m having a tough time remembering if I really read to my son when he was that age!